Adult Position Pins showed up in 1968 to replace older types of adult position insignia. 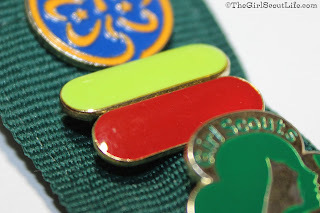 Only 1 pin was to be worn between the WAGGGS pin and the membership pin. The exception to the rule was for adults that were also troop leaders, and then the two bars were worn side by side with the yellow (Troop Leader) bar towards the inside. Insignia tabs were introduced in 1977 and allowed no more than 2 pins (regardless of which 2) to be worn one above the other in the same location. This has continued to today. Are you wearing the right Adult Position Pins? In 2011, with the change in the badge program for girls, also came a change in what the colors mean for adults. Now with the changes, I do not know if they still have position pins for the Honorary National President or the striped one for Board Alumni. I currently wear Lime Green as a Learning Facilitator (Trainer) and Red since I work so much with Camps. Which colors do you get to wear? Click here for a printable!